The subcompact crossover appears well on its way to becoming the new cheap-and-cheerful. While they’ll never be truly cheap like the smallest cars on the market, the added capability these tiny SUVs come with – especially for drivers in northern areas, where available all-wheel drive and a little more ground clearance are a major bonus – make them worth the extra cost to the right buyers. In that light, it’s no surprise that the while subcompact crossovers keep trending upward. One of the veterans in this relatively new space is the Mazda CX-3, which originally hit the market for the 2016 model year. 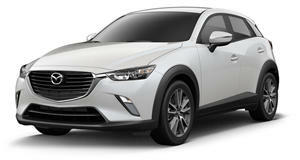 At the time, observers scoffed as Mazda chose to replace the Mazda2 with the not-at-all-similar CX-3 in North America. Now, with a dramatically increased number of competitors having emerged from American and Japanese automakers alike, the decision seems downright prescient. . The 2.0-liter four-cylinder Skyactiv-G engine gets a very slight power bump, up to 148 hp from 146 thanks to some minor engine tweaks that reduce internal friction and increase low-end torque by 6.2% while improving fuel efficiency. Peak torque remains the same at 146 lb-ft, fully available at 2,800 rpm. In practice, for the size and weight of the vehicle, that small change in torque at the low end really does make a difference. It now has a satisfying amount of oomph under the right foot from a standstill. I’d still rather see it deliver a bit more for passing maneuvers at freeway speed, but that’s mostly a nitpick when you consider it against the competition. Its excellent handling is managed through Mazda’s G-vectoring control system, which works to keep pitch and roll to a minimum. Steering, though, feels relatively relaxed and not as direct as it could be, a trait that carries through most of Mazda’s SUVs. The suspension is tightly sprung, which is an uncommon treat in this segment and is a bonus for those who enjoy a little driving dynamism, but it does come across as a little harsher over rougher roads than some passengers might find comfortable. In terms of ground clearance, not all vehicles in this segment are created equal. While the and Jeep Renegade both measure up at 8.7 inches, and the comes in at 7.8, the CX-3 offers only 6.2 inches, a factor to consider if you’re in a region where this could become important. On the other hand, where the Mazda is far and away the leader is in styling. The long headlights, clean angles, and floating roof design bring it about as close to beautiful as a micro-SUV is likely to get. That attention to detail carries through to the interior, where higher trims sport suede accents and body-color vent inserts. Attractiveness doesn’t always translate into functionality, though. For example, I respect the reasoning behind putting the tachometer front and center on the instrument cluster, but it leaves the digital speedometer relatively small and hard to read at a glance. There’s an available head-up display to counteract that, but it’s the flip-up kind, which I find my eyes don’t adjust to as well as the sort that projects directly onto the windshield. The driver’s seat is comfortable in the hips, but it doesn’t adjust to go quite as low as I prefer. I’m not especially tall, but I am tall in the torso, and my head ends up not having a lot of room even when I drop the seat right to the bottom of its range. I also find that the headrests have a forward lean to them that hits right at the back of my head and forces my shoulders to slouch when I lean back, and no amount of adjusting can make it go away. The primary cupholder is created by flipping a small panel up in the forward section of the center console. That’s great for making the space more diverse, but it doesn’t hold an unevenly shaped cup or bottle nearly as sturdily as a built-in does. The second row is roomier than most with plenty of leg room left even for adults, although when those seats are in use and the headrests are lifted into position, a fair bit of the visibility in the already-small rear window gets taken away. Where the CX-3 might leave a buyer’s shopping list the quickest, though, is in the cargo area. At 10.1 cubic feet, this space is painfully small, as is the hatch width. Add on a high load floor height and the complete absence of a power liftgate, even on the highest trims, and it’s clear that making this part of the car user-friendly wasn’t a high design priority. Mazda’s infotainment hasn’t changed much over the last few years – it still uses a central dial for inputs and still doesn’t have Apple CarPlay or Android Auto functionality. For what it does have, however, it’s quite nicely laid out. It takes too many turns and pushes to get to a lot of the important things like browsing radio stations, but it’s easy to navigate quickly once you get used to it, and it has some well-considered features such as the optional navigation system showing the name of the upcoming cross-street even when you’re on a different screen. Still, as recently as two or three years ago, the Mazda CX-3 was one of the best options available to a subcompact crossover shopper. Today, there’s a lot more choice, especially for those who prioritize technology, usability, and cargo space. That leaves it a top choice only for the people who care most about good looks, quality drive feel, and fuel economy, another area where the CX-3 performs very well. 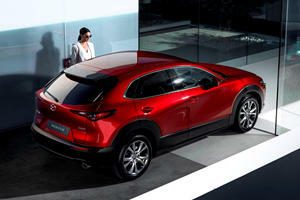 For a specific subset of buyers looking for these attributes above all, the CX-3 will be an excellent choice. If they don’t hit the top of your list of priorities, you can comfortably shop elsewhere. Raise the ride height. Add some body cladding. Bingo. 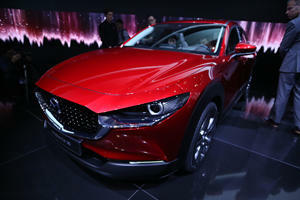 Why Isn’t The Mazda CX-30 Called The CX-4? Turns out there’s a good reason why Mazda's new compact crossover has a confusing name. 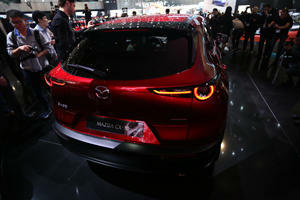 Mazda’s new compact crossover slots in between the CX-3 and CX-5.